Something old, something new, something borrowed, something blue...this week I had a bride from Australia, whose parents are from Greece and Malta and she was talking about this very old wedding rhyme, which got me thinking about Cayman wedding traditions again. 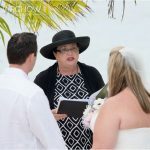 I am often asked if there are wedding traditions and customs unique to Cayman. One such tradition has to do with the champagne cork, and I have written about this before. In Cayman we have customs which are handed down by word-of-mouth, the origins of these have been lost in the mists of time. Perhaps it has to do with the fact that in those days, everything had to be imported from somewhere else, usuallly the port town that Caymanian men frequented like Port Arthur, Texas, Mobile, Alabama etc. 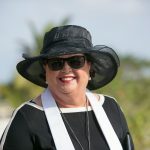 Caymanian men were sailors and they would buy and bring the bridal trosseau home when they came home on leave. My mother once told me that her entire trosseau was bought and brought home by three of her uncles. teenagers. I can still remember the hand-crocheted antimicasters, since you also collected household linens etc to take to your new home. 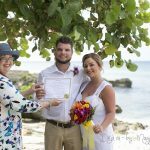 When I was a bride, 37 years ago, one such tradition was "the laying out of the Bridal Trosseau"
I have never seen this written about anywhere else, certainly the modern Caymanian brides don't seem to know about it. After her engagement, but before her wedding the Bride-to-be would lay out all her finery on her bed, yes, everything including lingerie, and invite her friends to come over to see it. There was a proscribed number of things you were supposed to have. I remember I had seven nightgowns. Then there was the matter of "The Second Dress", or the going away dress you changed into after the reception. My Second Dress was a pink hot-pants number, those were the first mini-dress years, and everybody found it very daring. After the inpection of the trosseau, everybody had punch and corn-beef sandwiches, and cake of course, so it was sort of like a bridal shower. I don't hear very much about Bridal Showers today, but years ago it was unheard of not to have one. The most important thing was that it was supposed to be a surprise! No men were allowed anywhere near the event, since they would have been shocked to hear the bawdy jokes and see the pranks the girls got up to. Of course the BTB sat under a decorated umbrella. The idea of a Bridal Register was very new in those days, so the gifts were very ordinary, every day things like towels sets, and pyrex dishes. For my shower, the Maid of Honour was coming in from New York, and my sister was too young, so I planned the whole thing myself (and then looked suitably shocked, and delighted)! Another tradition we had was "sounding the car-horns" after the wedding as the Bride and Groom drove away to the reception. Perhaps this is not so popular now, being a "pagan" tradition, the loud noise was intended to drive away evil spirits. Talking about evil spirits, many bridal traditions sprung from the ancients belief that the bride had to be protected from evil spirits. For example, strewing the ground with petals was meant to protect the Bride from the "ground monster" by spreading a layer of protection between her feet and the dirt. The bridal veil was also originally intended to disguise the bride so she would not be recognised by evil spirits which would try and harm her. In a Jewish ceremony, the Chuppah provided a sanctuary from evil spirits. Tying old shoes to the back of the going-away vehicle is a Hindu custom, to wish the happy couple good luck. When I was married, the custom in Cayman was for the groomsmen to tie old cans to the bridal couple's car, and what a clatter they made! Decorating with an abundance of flowers, symbolises the wish for the Bridal Couple to be fruitful. In those days, there were very few florists on Cayman, and many of the floral arrangements were made up with silk flowers. 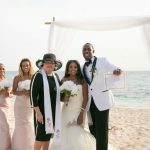 I was fortunate enough that my mother's cousin owned a Miami flower-shop and she came to Cayman to do my wedding flowers, everything was pink rosebuds, 150 of them! The thing I remember most about my wedding bouquet was that it had a detachable pink rose-bud corsage in the middle (which I took out, before I threw my bouquet) and wore with my pink hot-pants outfit to go on my honeymoon. Since we were going to Trinidad, to see my in-laws who were Hindu, I shudder now to think how this out-fit struck them! Fortunately they didn't hold it against me, as I only have good memories of that initial meeting, and a loving relationship with my whole Trinidad family over many years. In my mother's time, no wedding finery went to waste. My mother's wedding dress was cut and made into a christening outfit for me. As a little girl I still remember dressing up in her wedding veil with its pearl tiara. Did you know that the wedding tiara was made popular by Princess Eugenie when she was married to Napolean, and wore a diamond tiara? These days I see very few tiaras being worn. These days, the wedding "up-do" is very popular, many brides wear small flowers in their hair and eschew a veil. When I was married, long, loose hair was still the norm. This was before the advent of blow-dryers (at least in Cayman) so I spent hours at the hair-dressers with my hair put up in those huge steel rollers under one of those hard-topped dryers. Unfortunately, that evening we had one of our frequent power outages, so I raced to my wedding with my hair in wet ringlets! Well...quite a trip down memory lane for me!